Spring Cleaning: How to get the most out of it without letting it get the best of you! Spring Cleaning is a task that many of us undertake this time of year. It feels good to get everything nice and neat and to clear out anything we may not need. Do you have any tips for spring cleaning? Post them in the comment section! Washing the windows: Be sure to pick a cloudy day to wash windows (that’s a hard one in Wyoming!). If it’s too sunny, the cleaning solution can dry before you finish the window, as well as cause streaks. Door tracks: Do you have sliding doors in your home? You may not notice how much dirt and debris builds up in the tracks, but getting rid of it can also help your allergies! How do you clean those tracks, though? Use a toothbrush to loosen the debris and then use your vacuum hose to remove it. Finish with a wet sponge. You’ll be amazed! Deep clean the carpets: You may want to have it cleaned professionally every 12-18 months. Want a more affordable option? You can rent a deep cleaner or purchase a professional-style model designed for home use. Under furniture and appliances: These areas often get overlooked in everyday cleaning. Before moving any heavy items, enlist the help of someone to help you move the items and be sure to use proper lifting techniques. Dust light fixtures: Did you know that dirty light fixtures reduce the efficiency of the light, causing electricity bills to increase? Use a microfiber or lint-free cloth to dust fixtures and bulbs that you can reach. For ceiling fans, use an extendable duster instead of a ladder. Caution: be sure bulbs are cool to the touch and your hands are dry. Get organized: Eliminating clutter will help you feel like you have more space as well as reduce the risk that you may fall over some of the clutter. Stay tuned for our upcoming post on reducing clutter. Safety inspection: Take this opportunity to check the batteries in your smoke and carbon monoxide detectors. Don’t have a carbon monoxide detector? Read this blog about carbon monoxide. Use these tips to get the most out of your spring cleaning! 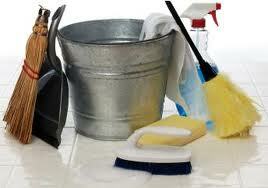 This information is adapted from Better Homes & Gardens: Spring Cleaning & Organization Guide.